Ever wondered what it would be like to be a sumo wrestler?? Now you can find out with our sumo suits! You will be given directions on how to use it (It is very easy). 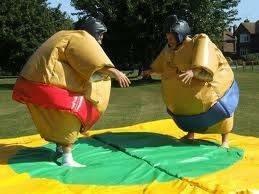 You and a friend can duke it out sumo wrestler style. Always a good time for any type of event. This is a great interactive for adults trying to have a good time.